Steve Poole – Hanged at the scene of their crime. Rosie MacGregor – Angela Tuckett. Nigel Costley – West Country Rebels. Melissa Barnett – Dame Florence May Hancock. Jeremy Corbyn MP – From Wiltshire to Westminster. A dramatic cover featuring Combe Gibbet set against a thunderous, threatening Wiltshire sky greets the reader of this short book. 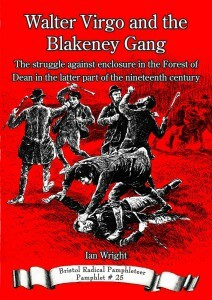 The work certainly does not fail to deliver on one aspect of Wiltshire’s past dark and cruel criminal justice system. 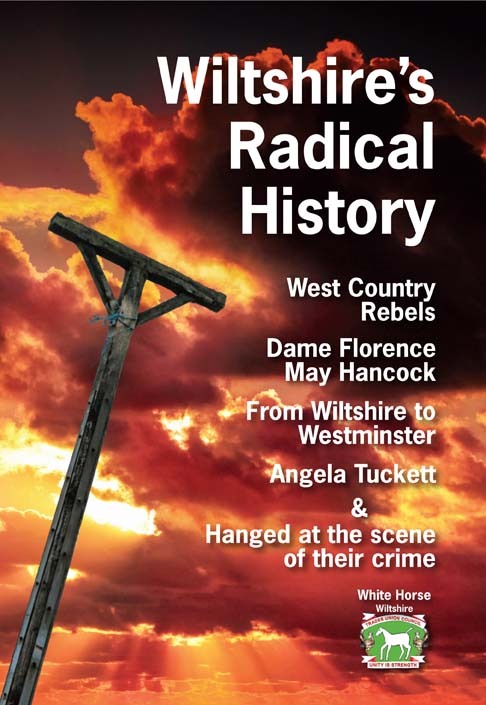 On the other hand the publication also contains two recent biographies of politically motivated women connected with Wiltshire’s radical history. The collection ends with a charming personal account of Jeremy Corbyn’s early childhood memories of living in rural Wiltshire and Chippenham. This is a must read for historians interested in rural social history, students of local history and those who enjoy a lighter read about interesting historical people. 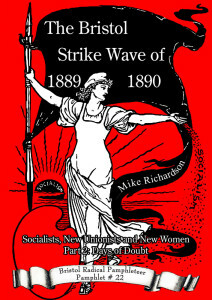 The book is the second volume of local history to be published and produced by the White Horse Trades Union Council. 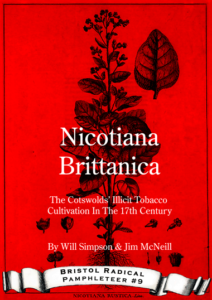 The pages bring together a compendium of a series of talks given at a history day school held in Chippenham during 2014 that was organised by the White Horse Trades Union Council. Gender, class, politics, rural culture, labour and law are the focus of this easily readable book and the topics are examined in historical context by the authors. The true life characters have been well researched and their lives are certainly brought to life, especially the lives of Angela Tuckett, one of the country’s first women solicitors, and Florence Hancock who was to become the second woman president of the TUC General Congress. The authors offer us vivid descriptions of the funnier and quirky sides of both these women’s lives as well as writing about their important and influential achievements, often against the odds. 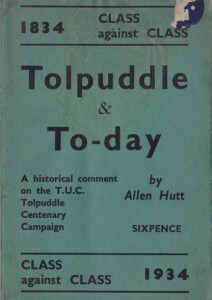 The emerging theme is one of how individuals, particularly the two women, Angela Tuckett and Florence Hancock, devoted their lives to improve the everyday circumstances for Wiltshire’s rural working class and inevitably the nation as a whole. Each of the contributors presents their work as a combination of primary research and anecdotes from people who remember the characters. What develops is a vision of impassioned lives and the sometimes violent events that shaped our nation’s history. 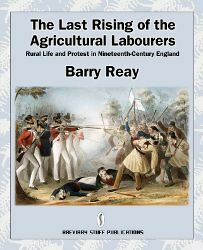 Past rural rebellions and the often savage response by the rich and powerful are revealed along with how localised power of those in authority were able to suppress the poor of rural Wiltshire. The book opens with a study into the barbaric practise of ritualised hangings, or more to the point strangulations, that took place near to the scene of a crime, referred to as ‘crime scene hangings’. 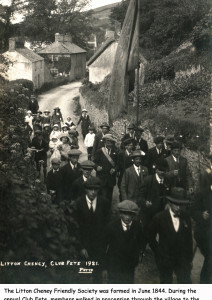 Steve Poole, Professor of History and Heritage at the University of the West of England, offers graphic accounts of some of the long and costly processions that conveyed the condemned from gaol to the noose that took place in the early nineteenth century in rural Wiltshire. The gallows and gibbet were often placed on top of a hill so the public could easily view the condemned person being carted to their place of execution and to witness the execution. The rural locations meant that the hangmen were inexperienced and the apparatus used were amateurishly built with no drop system. Perpetrators of crime, some guilty, some pleading their innocence for crimes such as poaching, and one poor women being accused of infanticide but swearing that her baby had in fact been stillborn are justifiably mentioned. Poole explains by this time in other parts of the country, including in London as early as 1783, hangings were a now a quick and much cheaper affair and were taking place within the walls of prisons. Poole examines national and local cultural politics, as well as the power of the local authorities in rural Wiltshire. He also examines the reasons why he believes sheriffs and assize judges in Wiltshire continued to practise the out dated, expensive ritual of crime scene hangings, and if this was in fact a deterrent to keep public order. The darker side of the book is balanced by the intriguing and lighter side of some of the other characters explored. Angela Remembered: The Life and Times of Angela Gradwell Tuckett, by Rosie Macgregor, Secretary of the White Horse (Wiltshire) Trades Union Council, explores the interesting life of Bristol born Quaker Angela Tuckett. Angela was born in 1906 into a well-to-do political and artistic family. The reader is taken for a walk through Angela’s personal and politically active life instigated after Angela witnessed first-hand the plight of the unemployed in Bristol. 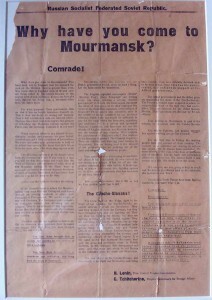 Angela joined the Communist Party of Great Britain, where she was quick to organise meetings and faced baton charges by the police at two violent demonstrations in Old Market, Bristol during 1932. Angela’s personal life is extensively written about and makes for a fascinating read. 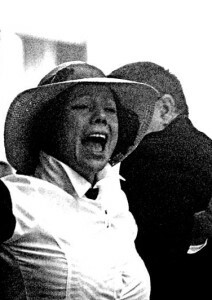 Later in Angela’s life she spent her years living in Swindon where she worked as a peace campaigner, workers’ rights activist and concertina busker while wearing a miner’s hat! This is just a small taster of the full and accomplished life Angela had led. Macgregor has certainly undertaken and uncovered some captivating insights into the world of an insightful and inspiring woman. A potted history follows next written by Nigel Costley, Regional Secretary of the South West TUC, titled West Country Rebels. 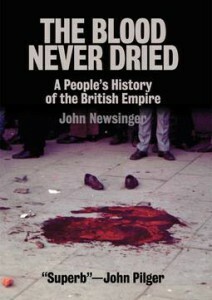 This is a digest of just a few examples of rebellion and resistance in the south west of England, taken from extracts of his book by the same name. Given a worthy mention are the many Cornish rebellions starting with the rebellion of 1497 led by Michael An Gof, a blacksmith from the Lizard, and Thomas Flamank from Bodmin. The continuing rebellions were always brutally put down be the Crown. 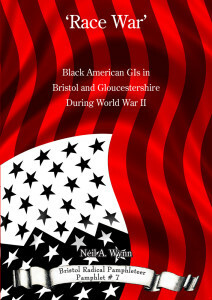 Enclosures, the Civil War, the Swing Rebellion and Non-Conformists are also mentioned. Tantalising stories of smugglers and press-gang resistance are delved into with tales from across the south west region. 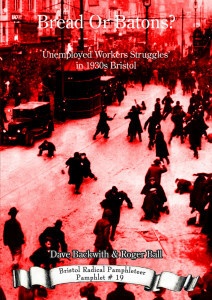 Costley’s contribution offers the reader a brief introduction to a few of the noteworthy high-points of the history of working class rebellion in the south west. An absorbing and comprehensive biography about the remarkable life of Trades Unionist Florence Hancock is next in line, written by Melissa Barnett, Curator of Chippenham Museum. 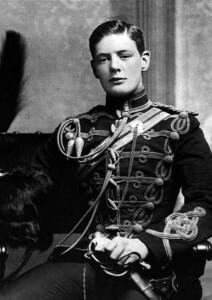 Florence was born into poverty in rural Wiltshire. The author maps out the difficult and challenging times Florence lived through during the early twentieth century, who through her leadership qualities was to become a rising star in the TUC and ultimately President of the Trades Union Congress during 1948. Born in Chippenham in 1893, in Factory Lane, a street that was frequently flooded from the nearby River Avon with sewerage and factory waste. Although living in others parts of the country Florence always felt her roots remained in Factory Lane. The slum area mainly housed poorly paid and over worked weavers of the town and other factory workers. The article is well illustrated with relevant nostalgic photos of the early twentieth century, including a rare photograph of the rear of the cottage in Factory Lane where Florence was born. Barnett brings to life the deplorable living and working conditions for the average factory worker in Chippenham at the beginning of the twentieth century; conditions that were to have a huge influence on the young Florence. 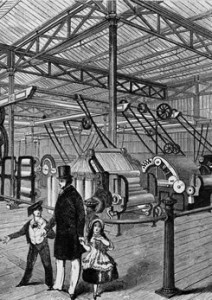 Aged just 12 ½ Florence was forced to leave school to work as a washer up at a local café to contribute to the family’s income. As in the case of Angela Tuckett, Florence came from a politically conscious family. Her grandfather was a Chartist, her father a militant radical, and her mother had gained a reputation for heckling at political meetings. Florence became a women’s suffrage supporter at the age of 14, at the same time she was by now working a 55 hour week at the local Nestle condensed milk factory, rising to 60 hours a week by 1913. Barnett develops her biography of Florence’s life to delve into her strike leadership qualities and subsequent campaigns for the improvement of workers’ rights, including decent wages, women’s rights, and improved working conditions. The final contribution is a personal address given by Jeremy Corbyn M.P. for Islington North, and Leader of the Labour Party since 2015. Corbyn began by recounting his heartfelt memories of his early childhood in Wiltshire, and said that rural Wiltshire had inspired his love of nature as a boy growing up in the countryside. On a political theme Corbyn brought together the historical references spoken about on the day and recalled how key socialists, and others, in Wiltshire had rebelled against social and political injustice. He also went on to say ‘One of the biggest issues facing us today is undoubtedly austerity and its threat to the fabric of the welfare state. 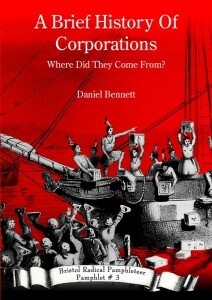 In the 17th, 18th and particularly the 19th centuries workers in rural areas faced absolute poverty…Workers campaigned for higher wages and trades unions played an important part in this’ (p.42). Many examples of collective organised action, undertaken by working people of a not so quiet rural Wiltshire, run throughout the book. We can read about the everyday struggles of the people in our collective rural history and learn about the sacrifices made by others – often only to be brutally suppressed by the authorities. The individual stories told within this book offer us an image of how people have always had to fight for their rights, sometimes led by extraordinary individuals who often paid for their actions with their lives. 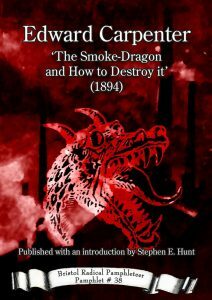 The intriguing accounts in this slim book gives us a glimpse at a forgotten side of life for the working classes in Wiltshire’s bygone days, skilfully and vividly brought back to life by the authors. All in all this work offers a thought-provoking and well-rounded collection of essays that would appeal to the serious historian and the casual reader alike.